Poor handling of the 15-pound crustacean, rescued from a Florida restaurant and headed to an aquarium here, may have led to his demise. Larry the lobster’s trip to the Maine State Aquarium didn’t go as planned. The 15-pound crustacean, who gained national attention after he was saved from a Florida restaurant’s boil pot with the promise of a new lease on life in the aquarium, succumbed during his journey to Maine, state officials said. Aquarium staff unpacking Larry on Wednesday after his trip from Sunrise, Florida, found him dead, said Jeff Nichols, a spokesman for the Department of Marine Resources, which runs the aquarium in West Boothbay Harbor. Larry was probably between 60 and 80 years old, although Melluso pegged him at 110, based on his weight. Scientists, however, say there’s no “established method” for calculating a lobster’s age. They can live for more than 100 years, according to the website of the Lobster Institute at the University of Maine. 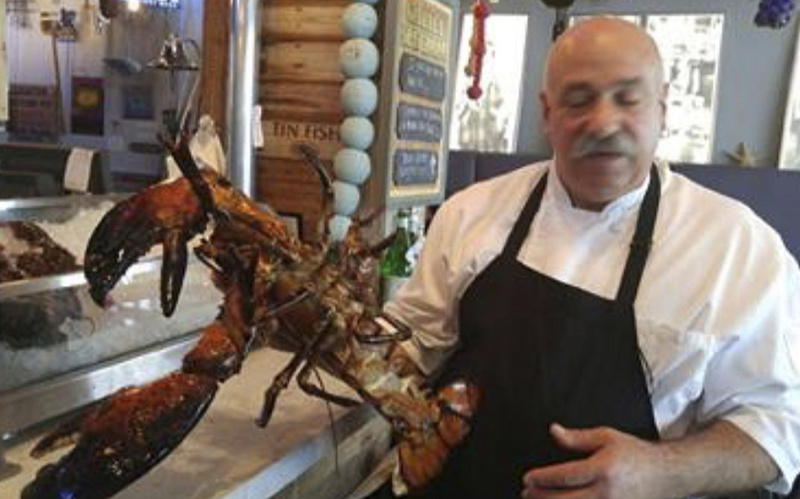 The herculean efforts to save Larry began after Melluso called a local TV station in Florida last week to show off the lobster of unusual size before he became dinner. That caught the attention of a Costa Rica-based animal rescue group, iRescue, which contacted Melluso and persuaded him to keep the creature alive. The group raised money to ship Larry to the Maine aquarium, and Melluso agreed to give him up. But the first hitch came when it was time to ship him about a week ago. The effort had to be scuttled when the packaging around Larry was found to be leaky and FedEx refused to ship him. An iRescue representative said the organization moved quickly to pick up Larry and find a temporary tank for him until further arrangements could be made to ship him to Maine. On Tuesday, eight days after Melluso first picked Larry from a seafood distributor’s tank, iRescue packed him up again, this time with guidance from the Maine aquarium’s staff. Larry was packed in a Styrofoam clamshell with seaweed and frozen gel packs intended to keep him cold. The Styrofoam package was then put in another box, providing extra cushioning and protection from leakage. iRescue did not respond to questions about the shipping cost. The packaging method has worked in the past for others who have shipped live lobsters to the aquarium, Nichols said. But when staffers opened the box Wednesday around noon, they found a motionless crustacean and broken gel packs. Unsure whether Larry was dead or alive, a staffer touched the lobster’s eye, but found it dry and unresponsive. Exactly where Larry was first caught is unknown, but it’s unlikely he was hauled up by a Maine fisherman. State regulations require fishermen to throw back lobsters with body shells longer than 5 inches. Such regulations don’t apply in Canada, meaning that Larry’s return would likely have been his second plane flight. The lobster’s death also reverberated with People for the Ethical Treatment of Animals, which had noted the commotion in Florida around Larry’s celebrity and advocated for his release back into the wild. The organization had hinted that its members might “take action” if the aquarium didn’t release Larry.